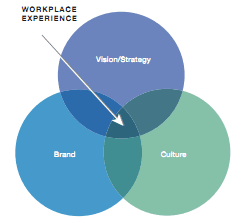 Which comes first — the culture or the brand? In today’s hyper-connected, ever- flattening world, it’s almost become a question not worth asking. and reflect each other in an interconnected system. One doesn’t change without the other; they can only evolve together. And the workplace is where it all happens. In the symbiotic relationship between brand and culture, brand is the outward manifestation of a company’s DNA and culture is the inward demonstration. The corporate world has been talking about organisational culture for years, but the emergence of brand as a discussion point in the executive suite is relatively new for many organisations. Of course, brand mavens like P&G and Coca-Cola live their brands every day, but at less well-known companies, brand has traditionally been left to the purview of the marketing department. In a competitive marketplace with a multitude of choices, however, organisations are realising that differentiation is critical to survival and a strong brand can help cut through the clutter.